Gugudan’s Sejeong has been spotted with a new shorter hairstyle, reminiscent of a 70’s to 80’s style. On February 13, Sejeong was in Daegu filming for KBS‘s Battle Trip with fellow Gugudan member Kim Nayoung. The girls were spotted wearing a Korean school uniform that students wore back in the 70’s to 80’s, along with a short bobbed hairstyle with bangs, one that was popular during that time period also. Kim Sejeong rocking a new short hairstyle. 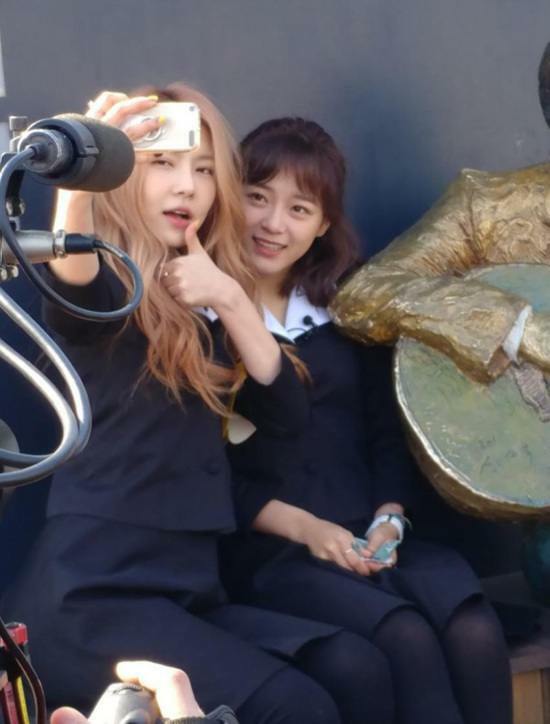 During the show, Sejeong and Nayoung enjoyed traveling and sightseeing Daegu, from enjoying ice cream to taking jump shots in front of Daegu train station. Check out these photos and gifs of the two enjoying their trip!